Flow cytometric analysis of HT-1080 cells, untreated (blue) or treated with Human BMP2 #4697 (50 ng/ml, 30 min; green), using Phospho-Smad1 (Ser463/465)/ Smad5 (Ser463/465)/ Smad9 (Ser465/467) (D5B10) Rabbit mAb (Alexa Fluor® 700 Conjugate) (solid lines) or concentration-matched Rabbit (DA1E) mAb IgG XP® Isotype Control (Alexa Fluor® 700 Conjugate) #30720 (dashed lines). 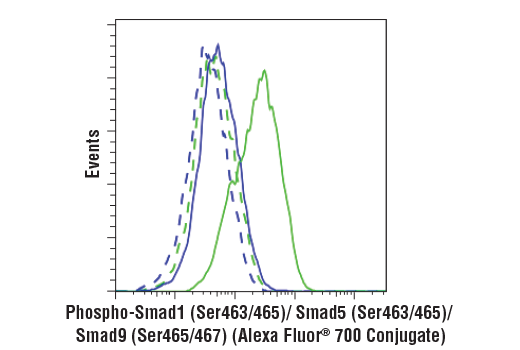 Phospho-Smad1 (Ser463/465)/ Smad5 (Ser463/465)/ Smad9 (Ser465/467) (D5B10) Rabbit mAb (Alexa Fluor® 700 Conjugate) recognizes endogenous levels of Smad1 and Smad5 protein when phosphorylated at Ser463/465 and Smad9 (Smad8) protein when phosphorylated at Ser465/467. Monoclonal antibody is produced by immunizing animals with a synthetic phosphopeptide corresponding to residues surrounding Ser463/465 of human Smad1 and Smad5 protein. This Cell Signaling Technology antibody is conjugated to Alexa Fluor® 700 fluorescent dye and tested in-house for direct flow cytometric analysis in human cells. This antibody is expected to exhibit the same species cross-reactivity as the unconjugated Phospho-Smad1 (Ser463/465)/ Smad5 (Ser463/465)/ Smad9 (Ser465/467) (D5B10) Rabbit mAb #4858. Bone morphogenetic proteins (BMPs) constitute a large family of signaling molecules that regulate a wide range of critical processes including morphogenesis, cell-fate determination, proliferation, differentiation, and apoptosis (1,2). BMP receptors are members of the TGF-β family of Ser/Thr kinase receptors. Ligand binding induces multimerization, autophosphorylation, and activation of these receptors (3-5). They subsequently phosphorylate Smad1 at Ser463 and Ser465 in the carboxy-terminal motif SSXS, as well as Smad5 and Smad9 (Smad8) at their corresponding sites. These phosphorylated Smads dimerize with the coactivating Smad4 and translocate to the nucleus, where they stimulate transcription of target genes (5). MAP kinases and CDKs 8 and 9 phosphorylate residues in the linker region of Smad1, including Ser206. The phosphorylation of Ser206 recruits Smurf1 to the linker region and leads to the degradation of Smad1 (6). Phosphorylation of this site also promotes Smad1 transcriptional action by recruiting YAP to the linker region (7). Hogan, B.L. (1996) Genes Dev 10, 1580-94. Hoodless, P.A. et al. (1996) Cell 85, 489-500. Klemm, J.D. et al. (1998) Annu Rev Immunol 16, 569-92. Kretzschmar, M. et al. (1997) Genes Dev 11, 984-95. Sapkota, G. et al. (2007) Mol Cell 25, 441-54. Alarcón, C. et al. (2009) Cell 139, 757-69.